SYNOPSIS - The Wheel of Time turns and Ages come and go, leaving memories that become legend. Legends fades to myth and even myth is long forgotten when the Age that gave it birth returns again. EXCERPT - Finally he said, "What did you spend do much time talking about with Ila? If you weren't dancing with that long-legged fellow, you were talking to her like it was some kind of secret." "Ila was giving me advice on being a woman," Egwene replied absently. He began laughing and she gave him a hooded, dangerous look that he failed to see. "Advice! Nobody tells us how to be men. We just are." "That," Egwene said, "is probably why you make such a bad job of it." Up ahead, Elyas cackled loudly. FL Speak - When I first read this series almost 8 years ago, I knew this was going to be my favorite series of all time. And I remember buying even the hardbacks as the new ones were later released. 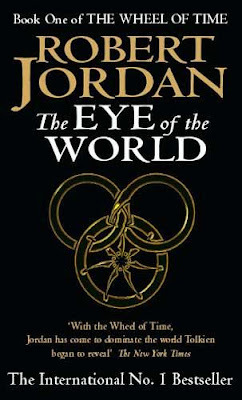 Next year, on January 8, the final book of 'The Wheel of Time', 23 years after the first book was published, the 'Wheel of Time' saga would come to an epic conclusion. How much the WoT series has affected me, it would be an understatement. Nevertheless, I'm re-reading all those books all over again, and today for the first time I'm reviewing those books, that made me foray into the wonderful world of fantasy and fall in love with it. In the world of Fantasy, Robert Jordan is a controversy. Half the world will start a riot for him while the other half questions his writing. I am on the riot maker side. 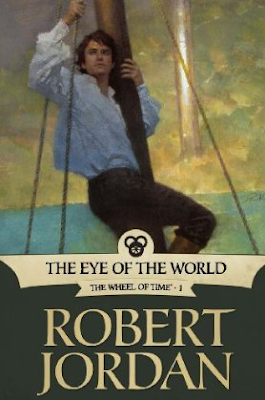 The Wheel of Time begins the 14 book long struggle of good vs evil. In Jordan's WoT series, the struggle between good and evil goes on. Since the creation of time, the Creator has imprisoned the Dark One in Shayol Ghul. Ever since then, the Dark One has been trying to escape. After every few centuries, the Wheel of time comes to a complete circle and the war between good and evil continues again. This is the Pattern. As the Dark One's power rises, the Pattern demands a hero to fight for the Creator. That hero is called as the Dragon Reborn. Coming back to the book, Rand al'Thor is a young boy living in Edmond Field with his father. When an Aes Sedai and her warder decides to visit the little village, things get interesting for Rand and his friends, Perrin and Mat. Suddenly creatures of the Dark One, Trollocs, attack their village. The Aes Sedai, Moiraine, explains to them that the creatures of the Dark One are after them and asks them to flee the village for the safety of their families. [now this is the most common formula in fantasy writing, a young hero, a guide, and loads of evil monsters. Nevertheless, Jordan somehow manages to draw you into reading this stuff] As the reluctant heroes flees the terror that is chasing them, they are separated by circumstances. With danger in every town they step into, the lads and Egwene must make their way to Tar Valon or be reunited with Moiraine if they are to survive the danger and make sense of the disturbing dreams they all share. I'd love to reveal a bit more of the book, but the joy of reading the first book would diminish if everything is spilled out. Believe me, this is one novel which follows the exact formula of escapism fantasy and yet manages to keep you hooked. The Aes Sedai's are beginning to be my one of the favourites and they remind me of the MordSiths of SoT. The poems and songs are beautifully penned. [not to mention that some are hilarious]. By midway, you'll begin to realise who's going to be the main character of the series. However, I should remind you though that almost 95 percent of the characters you meet here will be continued later, unless ofcourse they are killed or eaten by one of those nasty Trollocs. When you pick up this book, I hope to God that you read the entire series....and that means another 13 books. And if you thought Trollocs and Myrddraals are the worst things to chase you, wait till u finish the book. You're going to want to read the next one!